Toby, you look so regal. I really like this picture! Toby, I hope you are feeling okay; this image seems a bit somber. He's sitting where there used to be houses. He was too big to fit into them. He does enjoy the scratching pads though. You look very handsome, like a statue in the sunlight. I got that rug from a past workplace. It was being thrown away, can you believe it?? It's one of my fav things. You look very deep in cat thought, Toby. 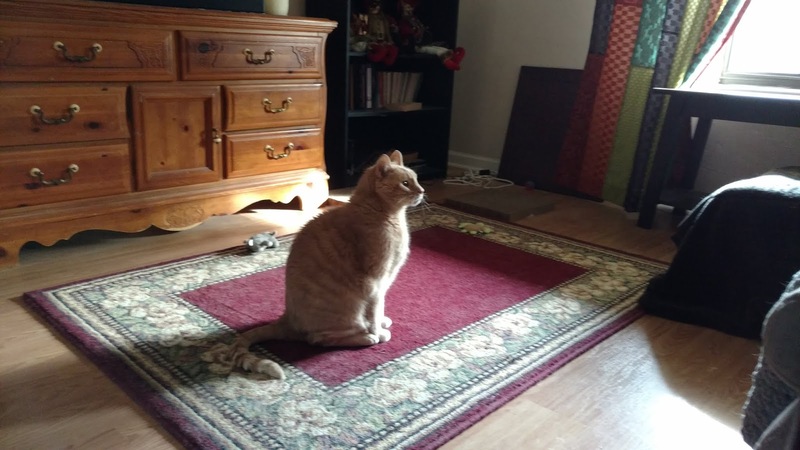 The colors on that rug really set off your furs nicely! Did your mom get it just for you, Toby? Toby, you look so regal in this photo! Thanks for sharing a really beautiful photo. Makes you wonder what are they thinking about right at that moment. Love the sunshine shining on you Toby. Have a great weekend.